The new Mortal Kombat won't be making the trip down under, now that Australia's governing body has effectively banned the gory fighter. Why does Australia object? And what new details on the game did it just reveal? The board's "decision report," via Mortal Kombat Online, seems to confirm a pair of Mortal Kombat combatants, outing Mortal Kombat 3's Kabal and Quan Chi, first playable in Mortal Kombat 4, as two of the 25 (likely) playable characters. That document also specifies that Mortal Kombat's story mode "includes more than 15 hours of gameplay" and that the game features "more than 60 fatalities," up to four per character. The document also explains that some of those finishing moves require unlocking, but does not specify how. It also goes into explicit detail about some of the more offending fatalities, including gun shots to the head, plenty of decapitations, the yanking of intestines and other bloody finishing moves. Feel like reading about them? Well here they are. Kung Lao throws his metal hat into the ground and it spins like a buzz saw. He grabs his prone opponent by the ankles and drags their body through the saw, explicitly slicing them vertically in half. Copious bloodspray is noted. Kung Lao holds up both halves of the corpse as blood pours out. Jade explicitly kicks an opponent into the air and plants her fighting stick into the ground. The opponent falls backwards onto the stick and is explicitly impaled, with the stick protruding from their chest. Jade then explicitly tears her opponent's head off, with bloodspray noted, and explicitly plants it on the stick. Stryker tasers his opponent and then explicitly shoots their head off with his gun. Blood and gore is noted. Quan Chi explicitly rips his opponent's leg off, accompanied by copious bloodspray. As they lie on the ground, he explicitly beats them with the severed leg for a prolonged period of time. Scorpion explicitly slashes an opponent horizontally in two at the waist, with blood and wound detail noted. He then explicitly decapitates them and kicks their body over. As the severed head falls through the air, he explicitly slices it vertically in two. Mileena throws two blades at an opponent, which explicitly lodge in their chest. She slowly approaches and explicitly rips their head off, causing their severed neck to spray blood as their body topples. She then explicitly bites into the severed head before throwing it to the ground. Kabal uses long hooks to explicitly pull out an opponent's intestines before explicitly impaling the opponent on two spikes. 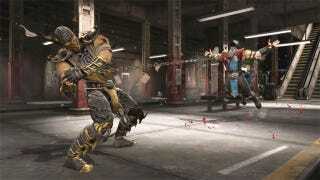 Shao Kahn uses his hands to explicitly rip an opponent's body vertically in two. Baraka explicitly lodges a blade (attached to his wrist) in an opponent's stomach and hoists them above his head. He spins them round and explicitly decapitates and dismembers them, accompanied by copious bloodspray. Kitana uses her 'folding fan' weapon to explicitly dismember then decapitate her opponent, with copious blood flow noted. Australia's classification board also takes issue with the game's x-ray moves, which show the internal damage done during certain attacks.